Is this Peugeot's Outlander-based 4007 SUV? It's no secret Peugeot is planning to introduce an SUV in Europe based on the Mitsubishi Outlander. The question is, how will the French infuse the Japanese ute with proper Peugeotness? 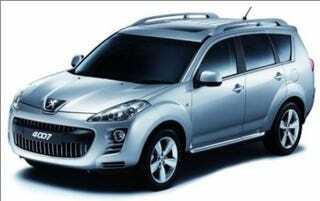 It could be these images of the Peugeot 4007 SUV are somone's idea of a one-panel joke, or they could be the real thing. Either way, we can't decide whether Peugeot's signature fascia adds character to the staid Mitsubishi or if the Outlander's angular shapes add gravity to Peugeot's wide-mouth-bass face. Maybe it's none of the above.